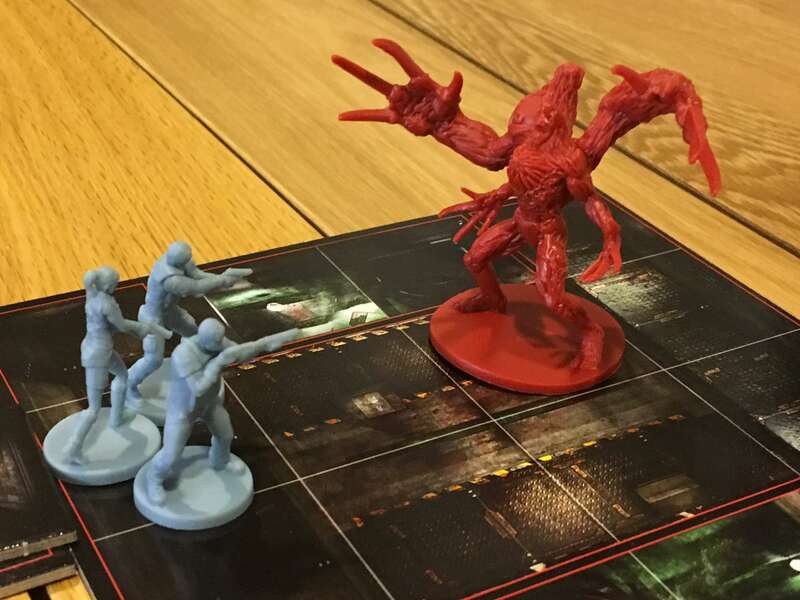 Possibly the most anticipated miniatures game in recent years, and almost certainly one of the most wanted video-to-board game conversions ever, Resident Evil 2: The Board Game is Steamforged Games’ latest effort. Following on the from the success of Dark Souls: The Board Game, Resident Evil 2 takes some of the most-loved aspects of the digital original and translates them onto the tabletop. In this case, does the dark atmosphere and slow, ponderous gameplay of Capcom’s classic survival horror make the leap intact and in good order? Let me tell you all about it. 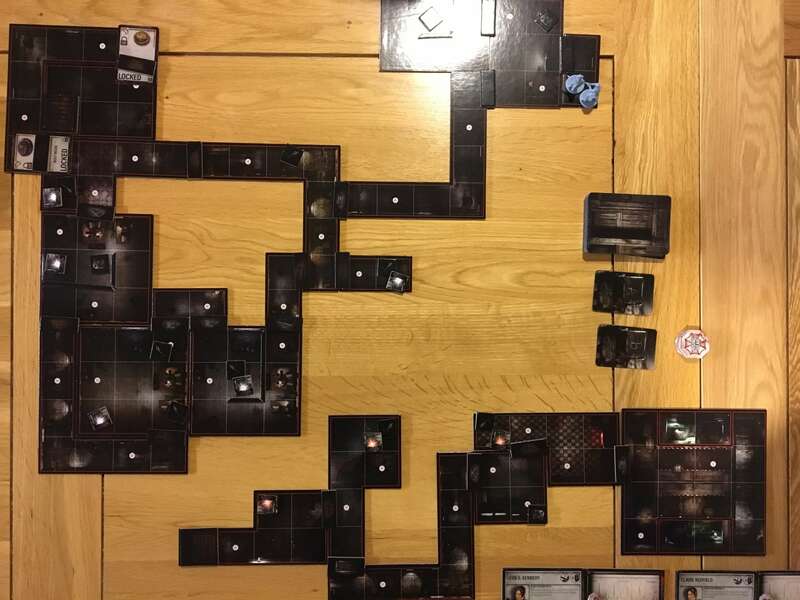 Firstly, it does look the part, but if I say that, I should also mention that Resident Evil 2: The Board Game seems to draw as much from the first Resident Evil game as it does from the second based simply on how dark the layout of the board is. In all honesty, this is a problem. There isn’t a single tile in the whole box that features a dominant colour besides pitch black. There is detail — from burning cards and sidewalks to office furniture and occasional lighting, but it’s almost indistinguishable. 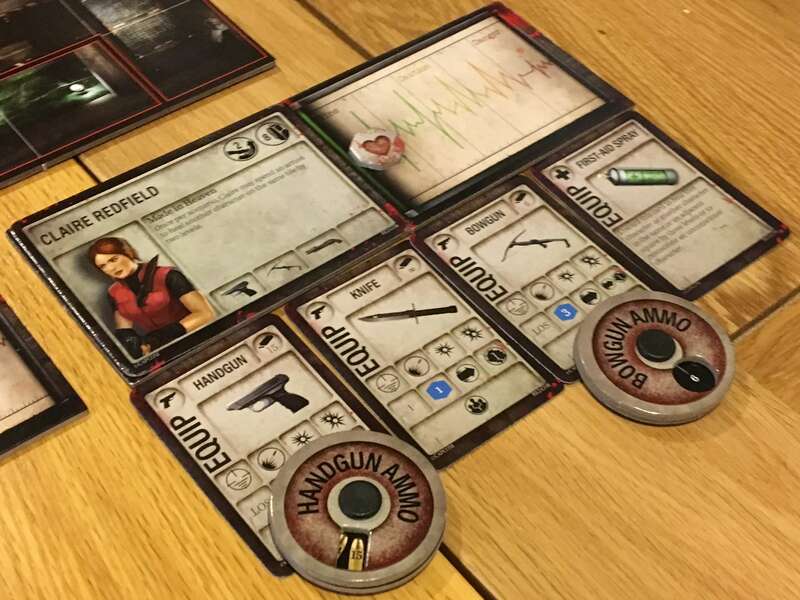 This may be intentional, given that Resident Evil 2: The Board Game uses a modular setup that is not dissimilar to most other games, but which doesn’t bother players with needing to track down specific pieces. If the setup for your current mission shows a three-by-three piece, that’s all you need to find, rather than looking for a specific one that might have certain scenery on it. I do appreciate this speedy, simple setup, but I’ll tell you what the sum of this is: Resident Evil 2 has one of the least appealing boards I’ve seen in years. Mercifully for a miniatures game, other aspects of setup are also relatively fast and simple. Each mission (of which there are eight in the base game I’m reviewing) features a board that takes about five minutes to assemble, then a number of item decks to build. Each of these takes a minute or two at worst and the actual character setup is also very simple. I really do appreciate not having to build complex decks, count cards and so on — there is some of that here, but not enough to cause a nuisance whilst keeping your guests entertained. The basic principles of how to play Resident Evil 2: The Board Game are also relatively straightforward to pick up and learn. 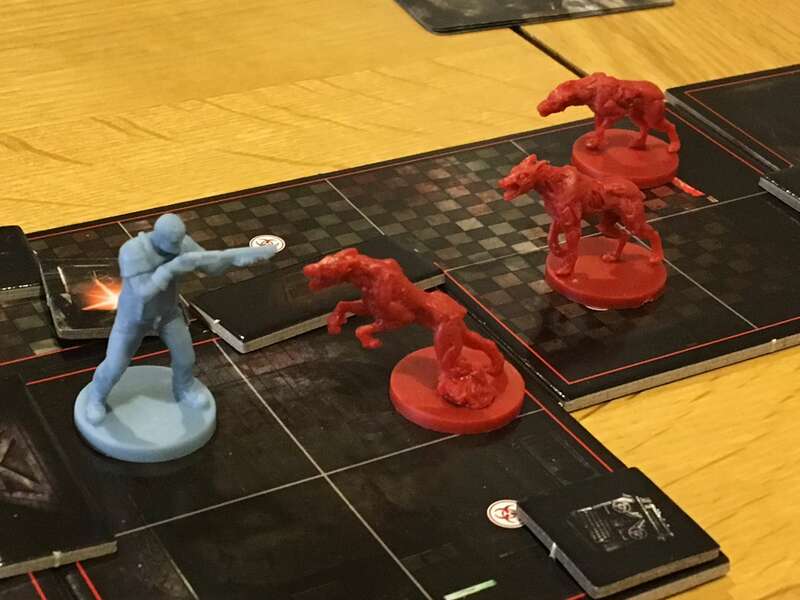 Each turn, a player has four actions to take from a fairly standard range of moving, stabbing, shooting and using items (among other things) before the zombies, dogs and lickers take their turn. After this, a Tension card is drawn from a fairly large deck. The Tension deck is one of the stacks of card that must be preloaded before the game begins and each mission requires different amber and red cards (all bad) alongside a standard set of green ‘All Clear’ cards. The most noticeable thing about movement and shooting in Resident Evil 2: The Board Game is just how well it represents the gameplay of the original video game. Fans of the original will certainly remember its rather slow-paced movement, and that is most certainly replicated in the board game. Movement is restrictive, meaning that survivors must plan their turns carefully and manage their moves efficiently alongside any other options. This is especially true when dealing with Lickers, which have the ability to lash out at passing player models. If you’re wondering why plotting movement is so crucial, it’s because shooting things in Resident Evil 2: The Board Game is even less fruitful than it was in the videogame. Ammunition is scarce and the handguns and knives that players generally start a mission with feel drastically underpowered. More powerful weapons like bowguns, shotguns and even grenade launchers can come later, but even when you have them, you’ll have very few shots to risk wasting on lesser targets. The lack of ammo and somewhat slow-paced movement does result in a classic Resident Evil style of play and I think considerable thought went into the creation of the systems that drive Resident Evil 2: The Board Game forwards. On that note, this is a purely cooperative game for one to four players and the objective will almost always be to get from point A to point B, sometimes having defeated a particular enemy or collected certain items on the way. Even when there’s nothing specific to search out, smart use of the loaded item decks and onboard tokens will mean that certain emblems or keys must be found to access important areas. The base game actually contains two boss miniatures that feature in specific scenarios. There’s the G-Mutant and the iconic Tyrant, both of whom come with their own set of special behavior cards. Where the regular enemies are simple and predictable to drive (making enemy turns fast) the bosses are much more powerful, but still simple to have in play. When a boss appears, a few special rules apply that force the players to stay within a certain area until it is defeated, which again, feels fairly thematic and appropriate to the subject matter. Ultimately, Resident Evil 2: The Board Game feels like a good imitation of the original video game in terms of how it hangs together mechanically and thematically, but it does come with a few flaws. Firstly, there’s the component quality versus price argument. The retail price for this base game is ninety pounds, which is, frankly, insane. The minis are of a decent but by no means amazing standard and the card stock is average at best — it’s a little thin and as I mentioned earlier, it’s just so incredibly dark. Doors come in the form of flimsy black tokens that barely stand out and there isn’t much else in the box. A few decks of cards, yes, but who cares about that when you’ve sunk almost a tonne? That said, if you’re a huge fan of the series and you take price out of the equation, Resident Evil 2: The Board Game is definitely a faithful representation of the video game you love. Personally, I’ve always been a fan of the series and over the years I’ve learned to accept many flaws. There’s no doubt that the video games have their fair share of dedicated fans and I am certain that this board game will have a few as well. Even so, I’d think carefully before sinking my hard-earned cash into this Kickstarter hype train. 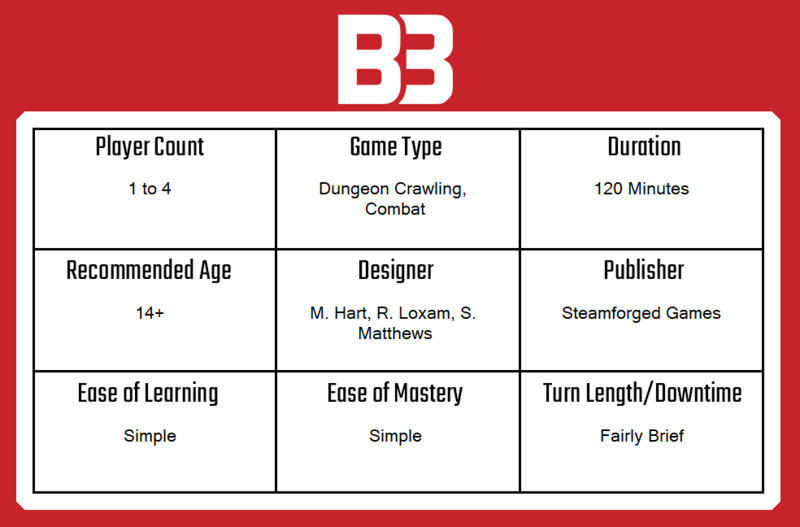 It’s not bad, but there are better miniatures games and better video-game tie-ins out there. Love both video games and board games? Here’s our list of some fantastic crossover games.